Our family with four generations stayed at this property for two weeks. It is a really lovely place to stay and the owners arranged everything we asked for including our transport from the airport,our arrival dinner,a cot and pushchair for the baby nothing was too much trouble. The gardens and pool are beautiful and provides a very peaceful setting. The property itself is spacious and comfortable and very well managed. 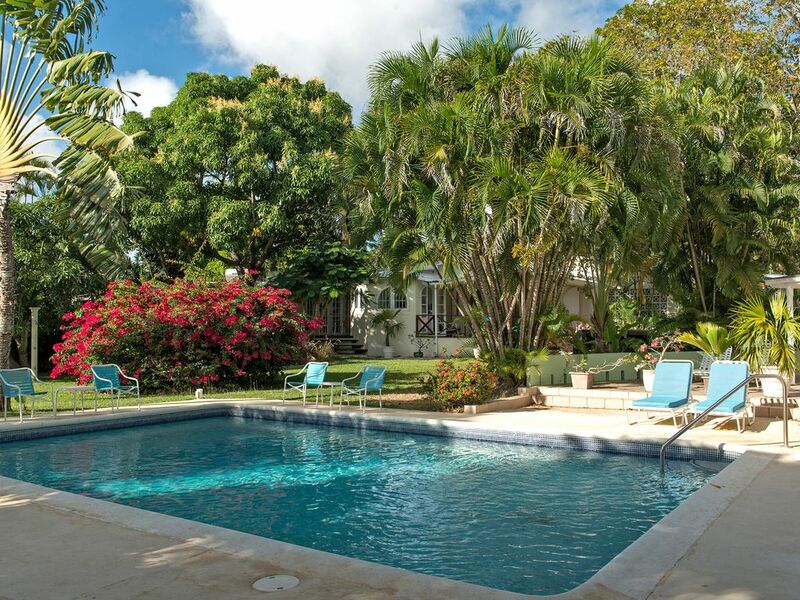 A short walk to the beach and very well positioned to enjoy everything Barbados has to offer including car rental. I would highly recommend this property you will will like us always want to return. We really enjoyed and loved the property as a large group gave us lots of space to mix and mingle. Andrew & Keelan were wonderful warm and friendly happy to help, she is an amazing housekeeper. however there were Shortfalls, mice in pool apartment, and by main house which they tried to resolve. WiFi didn’t work in main bedroom and sometimes not at all in 2bd apt area. housekeeper for main house not that friendly, didn’t know if she was around unless you saw her. Semi cleaned parts of house if not in use, didn’t do to same standard as keelan. also having to ask permission to use facilities ie laundry rm, mop or room paid for in advance. The latter can be viewed as a misunderstanding as we all have different expectations and experiences of self catering facilities. All in all none of this stopped us from having a delightful stay. The owners are also very welcoming, friendly people, so would definitely recommend this home despite the negative points. Thank you for your feedback and I'm glad you enjoyed your stay in Mullins Bay House. To pick up your points on the so called shortfalls: we resolved the problem with the mice but they usually only ever appear due to food being left out in the kitchen; the wifi doesn't work in the main bedroom as it has such thick walls and is unable to receive the signal from the router but it does work well everywhere else; we explained the situation about use of laundry facilities before you arrived and that both housekeepers will do your personal laundry though for some reason you didn't want to utilise this. This was our 3rd time at Mullins Bay Estate. We were 3 generations staying in Mullins Bay House, The Garden Apartment and the Pool Apartment. We had a wonderful time on this glorious island. The accommodation was superb and the staff were very helpful. We would highly recommend the property. This estate is a perfect vacation rental for groups ( family/friends). There is ample space and privacy with sufficient gathering spaces to come together . The proximity to Mullins Bay Beach makes "beaching" a breeze. Having the luxury of a pool on site was ideal, as the seas became quite turbulent during our stay, precluding swimming in the sea for several days. The owners are very engaged in the process and experience of renting their home and provide detailed information and assistance, which really enhanced our stay. The grounds are very picturesque and well kept. The monkeys really do come to visit the mango tree nearly everyday. The birds are plentiful and the foliage exotic. Many thanks to Sarah, Simon, Andrew and Oneta for creating paradise found! Lovely! Fantastic! That also describes Barbados! The house worked out great. Every bedroom has a bathroom with the exception of one. The back porch was where we lived. Have your coffee ready between 7:30 and 8:30 am to watch the monkeys play in the garden. Pool excellent to swim in after a day at the ocean. Beautiful yard. A nice walk to the beach, away from the 'noise'. Discovered the beach chairs a few days into our stay...make sure you look for them. Gibbs Beach worth the walk! Speightstown is a must. You can walk that too! Take the bus, it is a grand ride. Interact with the local people, they are very kind and helpful. Sarah was very helpful and even allowed us to stay a bit longer on check out day! Much appreciated! Try snorkelling everywhere but especially Almond Bay....Thanks Barbados for an eventful place to spend time with family and enjoy God's beautiful creation. Mullins Bay House ligger i den lummiga och populära Peterskyrkan församling Barbados med vackra stränder kantade av palmer och underbara solnedgångar över Karibiska havet. ---- Mullins Beach Restaurant är 350 meter bort och ett bra ställe för lunch blickar över kristallvatten. Bekvämlighet shopping är 800 meter bort tillsammans med 4 andra lokala äta platser. --- Speightstown, den färgstarka och livliga andra största stad i Barbados är drygt en mil norr med ett brett utbud av butiker, banker, barer och restauranger som mango och den berömda Fishermans Pub. ---- Holetown är 5 miles söder med cirka 20 restauranger och barer, taxfree shopping och andra tjänster. --- BRIDGETOWN huvudstaden är en annan 5 miles längre fram - och strax bortom det ligger de vita sandstränderna vid sydkusten. Andra aktiviteter: Luxury Spa 300 meter bort. Rates are for 7 bedrooms, 14 guests. Additional adult guests are £100 per week, additional children £50 per week CAR AVAILABLE - Our 5 seater Suzuki Grand Vitara or Honda Jazz/Fit are available at a reasonable rate as part of a package for guests staying at Mullins Bay House. BROADBAND WIFI - Broadband wifi network for guest's laptops, iphones etc.